Part of the power trio that formed DreamWorks in 1994, Jeffrey Katzenberg has now joined the Board of Directors at FarmVille's Zynga. 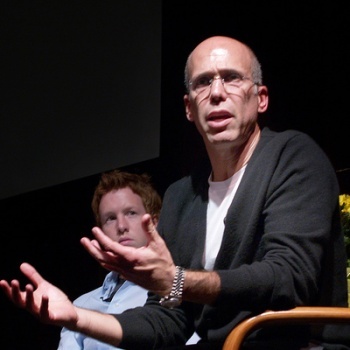 Katzenberg shocked the world when he quit Disney in 1994 to join Steven Spielberg and David Geffen to form DreamWorks Pictures and head up the animation division. Since then he's produced Shrek, Madagascar and countless other technically decent computer animated films. Zynga is most well-known for FarmVille on FaceBook but is hardly a one-trick pony with FrontierVille and Mafia Wars still entertaining the masses. By adding Katzenberg to the board, we will surely see more Hollywood marketing tie-ins with Zynga games such as the Rango themed quest in FrontierVille. "Jeffrey redefined storytelling when he launched DreamWorks Animation," said Mark Pincus the CEO of Zynga CEO in a statement. "He turned an independent studio into a brand name and his vision will be an asset as we work to define the future of play." The boardmembers of companies do not always directly affect the business, but the credibility and name-recognition that Katzenberg brings to the table for Zynga's possible Hollywood deals is huge. What would be the strangest cross-promotional campaign that Zynga and DreamWorks could come up with? A Shark Tale set of items in FishVille, or even Mafia Wars for that matter? How 'bout a Megamind take over of Cafe World?